March is Women history month, and we’re highlighting some of the young female entrepreneurs about to change the game — on their own terms. But how can we best support emerging female entrepreneurs who not only face the same hurdles all entrepreneurs face but have the added barriers women in business face, like the pay gap? It’s exciting to see the growth and recognition of a female leader, activist or entrepreneur, especially when that individual is young. Why, you may ask? Too often we are bogged down by our own fears, limiting beliefs and roadblocks (real and imagined), and more often than not it can take a long time to break through these hurdles. What if we could empower our youth to believe that age is not their limiting factor, that their voices are valid and should be heard, and while experience is so valuable, so is a fresh approach? Women still receive less than 3% of investment dollars, the pay gap is just as large as it was last year (and growing in some sectors), and despite conversations around diversity and inclusion coming to the mainstream — bright ideas are still being stifled and contained because of gender disparities. Since we are seeing so much discourse in the mainstream, naturally we want changes to happen immediately — wages to rise, investments to triple but the reality is things have not budged much. This shift will not happen overnight, it is an ongoing fight, and one that will see its effects truly flourish for generations to come. That is why it is so important that we value and showcase young females voices standing up, fighting and building their futures. We need other youth to see the possibility, and the reality that we don’t need to be a certain age or gender or educational status to create the change we want to see. By investing and supporting not just in female founders but also youth who are creating the next generation of work to where gender and diversity equity in business are actually equitable. There is a lot we can do to push the needle on this, starting right now. Showcase role models — highlight female entrepreneurs, of all ages, to show youth the potential and abilities female entrepreneurs have. At events, at school or even at work, encourage the inclusion of not only diverse females but particularly include a young female entrepreneur. If you know of a young female entrepreneur slaying it, make sure to tag her in the comments or if you are looking for one, hit us up. Be an Ally — Be more than a mentor, be an active ally for young female entrepreneurs. Not only supporting but showcasing them, giving space for their voices to be heard, rallying for them, advocating for them, and lifting them up when they need it. Invest in them — whether that is funding, time or resources. We talk about investment but are we really doing it? From idea to action, we need to see real investment being made into female-led ventures — particularly those started by youth. The world will thank you for it later. Connect them — So much of business is done through silent handshakes, closed meetings, late evenings and private clubs. Too often places that women have been historically excluded from. A warm connection or two can change a startup journey. Buy their stuff- How best to support a youth entrepreneur? Buy their product. It’s that simple. Now go do it! We compiled a list of the awesome young female founders on our radar. Here are some young female entrepreneurs we have had the privilege of working with over the years — great role models, vibrant founders, and bearers of their own futures. And not to mention created some must-have products! 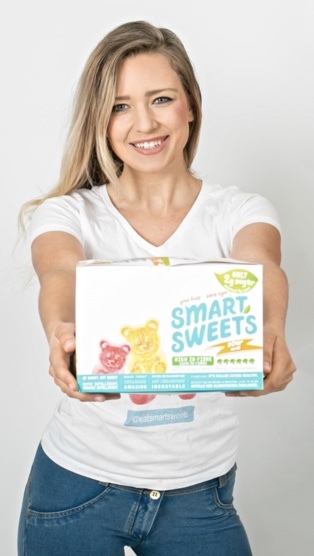 Tara Bosch — Kicking sugar was never as easy or tasty as with the delicious selection of Smart Sweets candies. You can find them at a grocer near you or simple purchase online — we promise you will not be disappointed. Bunny & Taran Ghatrora sister duo has developed a series of safe and sustainable products for your self-care routine and for your period called Blume. No big deal just popping up online, select Nordstrom locations, and Anthropologie. Check them out here Blume. Valerie Song — Ava Byte making indoor gardening simple, sustainable and smart, and the ava byte is a nifty little piece of gardening for your kitchen counter. Alison & Erin O’Halloran — A sister duo in New Brunswick is revitalizing the gift giving experience with their digital gift-giving app Newpy. Next time you are considering a gift, perhaps consider Newpy as a great option. 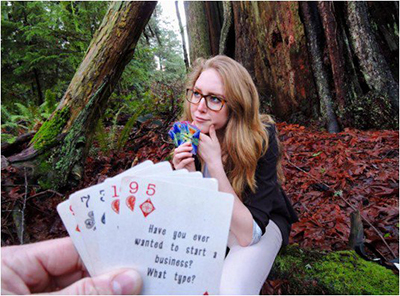 Maya Guy — started Basecamp Cards when she was only 16 years old, a novel way to engage with your peers and outdoor enthusiasts. Make sure to pick yours up at Mountain Equipment Co-Op. Sheen Sagalongos & Priyanka Vasudev — who built the first ethically rooted digital sourcing platform — Kanekta — to connect those often overlooked ethical brands with retailer buyers that need to hear about them. Madison Guy — In need of university tuition? Slammed with applications for funding? Look no further than the GrantMe platform to match you with the scholarship funding to support your studies. Tag a youth female entrepreneur or innovator that the worlds needs to know about in the comments!